Do you wish to restore the good look of your windows fast and without effort?Are you seeking for an approach of effective window cleaning? If the answer is positive, you have come to the right place! With the experts of window cleaning in Norbury, you will certainly bring back the daylight into your home. You will enjoy impeccable glass surfaces as well as completely clean frames and ledges. You will be able to use your newly-acquired free time as you wish while we shine the glass surfaces of your home. You will not only avoid this monotonous and troublesome work – our services will also give you some delightful benefits. We also provide our professional services in nearby areas: Streatham, Thornton Heath, Tulse Hill, West Norwood, Crystal Palace. You can rely on the team - they are the true experts of window cleaning. They all have gone through diverse training sessions, so you can get top-notch assistance for all window kinds. What we can wash includes: small, double, sash or bay windows, garden windows, patio doors, French doors, conservatories and roof windows. Your property can be improved quickly with our aid. Get in touch with us any time you need great window cleaning for your house or business. We promise that the windows of your commercial building will be neat and gleaming, like brand-new. Get that by just booking our commercial window cleaning. For windows as high as the fourth floor, we use water fed extension pole system which is completely safe and efficient. London is well known-for it's tall buildings. So when it comes to those highly-placed windows we will bring our rope access squad. With this efficient way of cleaning, we can give you finish surpassing any other! We are happy to use the most effective methods to ensure that you have the best window cleaning. The glass surfaces of your building will be spotless after we employ water-fed extension pole system and high pressure cleaning on them. We use our trucks to supply the poles with water and we can reach up to the fourth floor. In case you request washing of windows on taller buildings than that, we have rope access cleaners ready to go. Call us on 020 3746 3113 and get in touch with us – these effective procedures will bring you results right away. 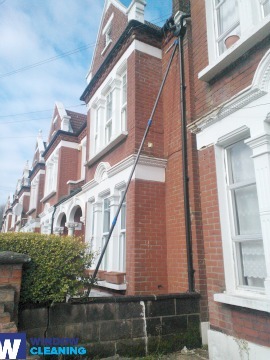 You will have absolutely clean home after the expert window cleaners in Norbury visit you. We deliver the best services for the entire London locality. The most advanced ways of cleaning are included in our working procedures – including water-fed extension pole system and and hard pressure cleaning. You will surely see the change domestic hygiene – we use purified water for the process of inside and out window cleaning. Call us today on 020 3746 3113. Our customer service agents will help you and answer your questions. Or you can use our on-site booking from.